Quench your summer thirst with this super refreshing Mango Ginger Agua Fresca. Summer is my favorite time to entertain because the party is always outside (plus I don’t have to clean my house!). Set the table, stock the cooler, fire up the grill and settle in to savor an al fresco evening with family or friends. And while we love our cocktails here at Garnish with Lemon, I also keep the kids and designated drivers in mind when we have guests for dinner. This Mango Ginger Agua Fresca is way more refreshing than a bottled sports drink and leagues healthier than a can of soda. Have you ever had agua fresca? It’s essentially a mix of real fruit, water and a hint of sugar that’s popular in Mexico and Central America. It literally means “fresh water” and is incredibly refreshing, especially on a hot summer day. Because I can’t leave well enough alone, I added some fresh ginger to my agua fresca. 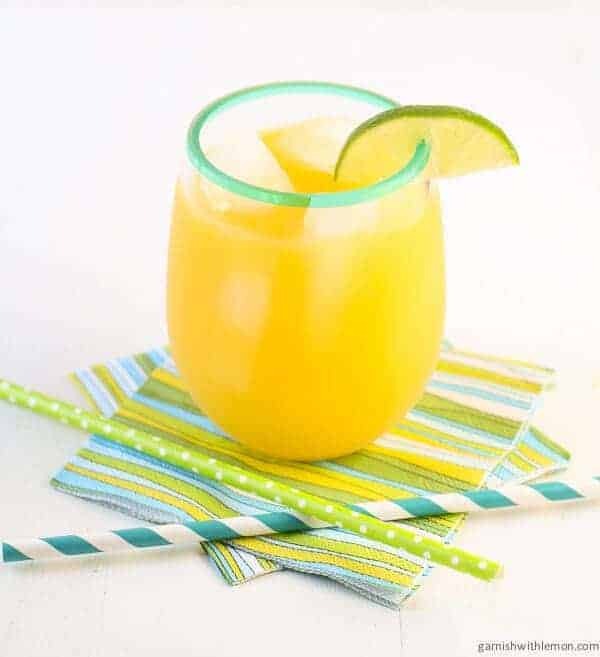 It gives the drink just a bit of zip and is a tasty complement to the sweetness of the mango. (FYI, this beverage would look gorgeous in one of those clear acrylic decanters with the spigot, in case anyone is looking for a birthday gift for me.) Float a few mango cubes in the drink along with the ice, and have guests help themselves. My bet is they will be sipping Mango Ginger Agua Fresca long after the sun sets. Place mango, ginger and 1 cup water in a blender. Puree until smooth. Press liquid through a fine mesh sieve into a small pitcher or large measuring cup. Add remaining cup of water, sugar and lime juice. Gently stir to combine. Refrigerate for at least two hours. Fill two glasses with ice and evenly divide agua fresca between glasses. Serve immediately. By clear acrylic bottles with the big spigot, do you mean the one I still wasn’t allowed to buy even with my 20% off coupon?! I need one. If only to make this beautiful and refreshing agua fresca for a party. Seriously, it looks so amazing and refreshing. Oh no! I sense a back story here, Kim. Hope you found a deal somewhere else! I totally need to make agua fresca this summer. I’ve seen so many great flavor combos, and it seems so simple and refreshing! Plus, mango + ginger is awesome! I agree, Julie; ginger + anything = awesome! Well this really does look incredibly refreshing! I am a huge fan of ginger, I try to use it often. I could see this becoming my new favorite drink! Now we’re ready for some summer heat, right? Bring it! It’s so humid here right now so that drink looks like exactly what we need. Love it! It’s super refreshing, Marly. Hope you try it! This drink sounds so, well, refreshing (duh). 🙂 Love the mango and ginger combo! I love agua frescas and mangoes!! This combination looks too good! What a perfect summer drink! It’s hot and muggy here, so this gorgeous drink would be perfect right at this moment! 🙂 Definitely the right kind of drink for a summer dinner party! I love that mango drink.